Convert forklift battery compartments from overhead-extraction to side-extraction with the Compartment Roller Tray – Low Profile Plate Mount (CRTL-PM) from BHS. Standard Compartment Roller Trays feature a height of 2.19 inches with full-length rollers. When battery compartments need more clearance, choose the CRTL-PM or the standard CRTL, which have a height of only 1 inch, leaving more space for batteries. The standard CRTL must be mounted within the battery compartment. The CRTL-PM, however, is built for simple drop-in installation. This creates a temporary side-extraction battery compartment. For more permanent service, users can opt to weld the Compartment Roller Tray – Low Profile Plate Mount into place. The CRTL-PM simplifies battery extraction with a grid of nine mini-rollers. A row of slide strips in the rear of the compartment help to keep batteries in place, but offer a low slide resistance for easy battery extraction. These battery beds are compatible with batteries of up to 3,000 or 4,000 pounds, depending on the model. The Compartment Roller Tray – Low Profile Plate Mount is constructed from heavy-duty steel and engineered to bear the load of most forklift batteries on the market. A durable powder coating finishes the frame. Both the frame and all components are resistant to electrolyte. 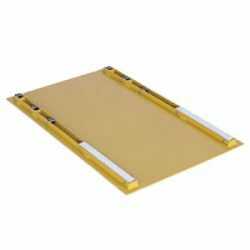 Like other products in BHS’ collection of Compartment Roller Trays, the CRTL-PM is designed to provide long, dependable service with minimal maintenance requirements. Learn more about the Compartment Roller Tray – Low Profile Plate Mount from BHS, and the entire line of Compartment Roller Trays, by calling the BHS sales team at 1.800.BHS.9500.